Recently it came to the Ryukyu Shimpo’s attention that due to an expanse of soft seafloor north of the land reclamation area, the Okinawa Defense Bureau (ODB) has abandoned its plan to establish three “marine work yards” there, for construction of the Futenma Replacement Facility (FRF) in Henoko. 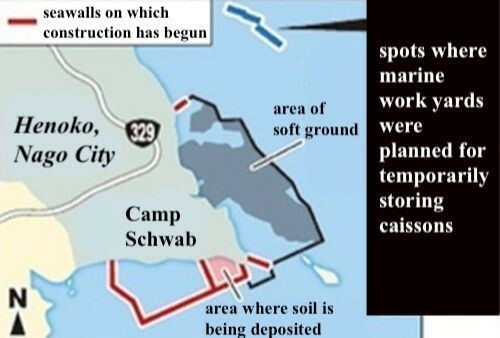 The ODB had planned to temporarily place caissons (reinforced concrete boxes) for use in the seawalls at these marine work yards, but in 2017 it abandoned this plan. It has not yet decided on a different place to temporarily set the caissons. Soft ground in Oura Bay not only requires ground reinforcement work, it is also likely to affect securing a spot to temporarily store caissons and lengthen the construction period. The ODB plans to perform ground improvement work on the soft ground in the designated land reclamation area, but that does not include the soft ground in the marine work yards. It has come to light that the ODB submitted a report to the National Diet containing documents that detail ground improvement work. The ODB threw many stones to the bottom of the ocean to build pedestal-like structures in the marine work yards. Thirty-eight cassions were to be built outside of Okinawa, hauled to Okinawa, and set atop the pedestals. Because all of these caissons cannot be immediately placed in their permanent positions in the seawalls, a temporary storage place became necessary. It would be difficult to establish a work yard atop soft ground, because if even one 7,400-ton caisson was placed there, it might fall and sink into the seafloor. Should the marine work yards be established as formerly planned, it would be necessary to perform ground reinforcement work on the soft seafloor. However, the environmental protection documents of the land reclamation application require that the ODB establish marine work yards with consideration to protecting the environment, restoring the area to its original state after construction. Construction that would use the marine work yards is not to take place until ground improvement work in the land reclamation area is finished. After this, the Japanese government plans to apply to the Okinawa prefectural government for alterations to the FRF construction plan, in order to perform ground reinforcement work. However, since the Okinawa governor’s approval is necessary to alter the construction plan, the Japanese government’s prospects for starting ground reinforcement work are grim.